Built with a gift from Richard and Sarah Smith “for the recreation of the young,” it opened in 1899 as a private park on public land, free and open to all. Created at the advent of the American Playground Movement, it is one of the first play spaces in the US. Location. 39° 58.93′ N, 75° 11.703′ W. Marker is in Philadelphia, Pennsylvania, in Philadelphia County. Marker is on Reservoir Drive, on the left when traveling west. Touch for map. Marker is in this post office area: Philadelphia PA 19121, United States of America. Touch for directions. Other nearby markers. At least 8 other markers are within walking distance of this marker. John W. Coltrane (approx. 0.4 miles away); The Philadelphia Zoo (approx. half a mile away); The Solitude (approx. 0.7 miles away); a different marker also named The Solitude (approx. 0.7 miles away); Henry O. Tanner (approx. 0.8 miles away); Strawberry Mansion (approx. 0.9 miles away); William Lewis (approx. 0.9 miles away); Ebenezer Don Carlos Bassett (approx. 0.9 miles away). Touch for a list and map of all markers in Philadelphia. More. 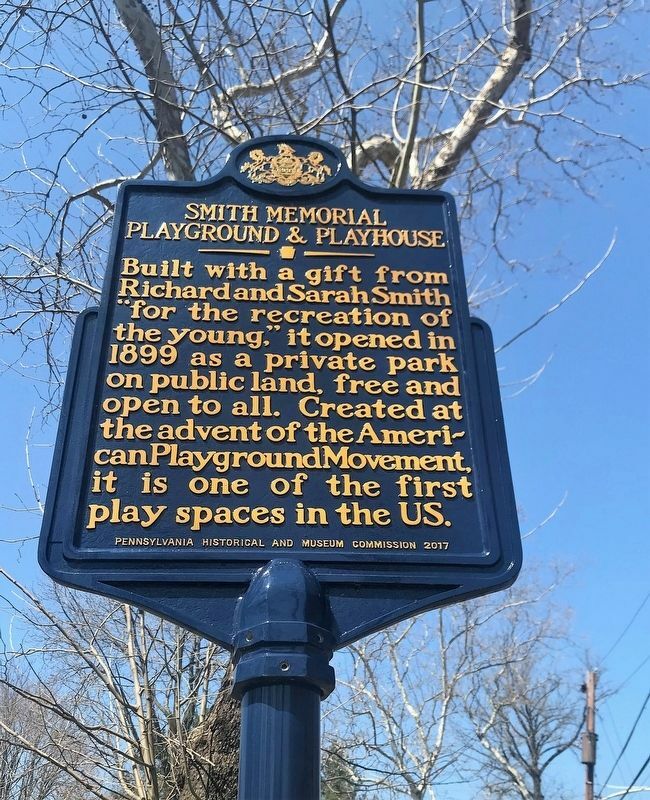 Search the internet for Smith Memorial Playground & Playhouse. Credits. This page was last revised on April 8, 2019. This page originally submitted on April 6, 2019, by Russell Galen of Lambertville, New Jersey. This page has been viewed 44 times since then. Photo 1. submitted on April 6, 2019, by Russell Galen of Lambertville, New Jersey. • Bill Pfingsten was the editor who published this page.